The State Board of Education’s Committee on School Turnaround has been traveling the state recently, getting input from different school corporations on the future of their lowest-performing schools. State Board of Education members Sarah O'Brien, left, and Tony Walker sit on the board's school turnaround committee, along with Dan Elsener. The group has been gathering input from various turnaround operators, most recently in Indianapolis. Thursday, the SBOE heard about the takeover efforts at Arlington High School in Indianapolis. The state took over the school in 2012, after it received a string of ‘F’ school letter grades six years in a row. Back then, the state chose Tindley Accelerated Schools, formerly known as EdPower, to operate the school. Tindley told the state board earlier this summer that they might not have the money to keep Arlington going, but with some help from IPS and the city of Indianapolis they agreed to push through the current school year. As far as what will happen beyond that, it’s up in the air. Tindley has made it clear that they wish to hand over control of the school, but the organization did not send a representative to Wednesday’s meeting. IPS has offered to step in, as has Charter Schools USA, a management company that operates three other takeover schools in the city. Close for a year, with plans to possibly reopen in the future. Modify which grade levels the school serves. Ferebee, representatives from the Indianapolis branch of the NAACP (who has expressed concern with discipline at Arlington), and Charter Schools USA presented this idea. Some of these suggestions include expanding Arlington to include K-12. CSUSA says they’d also like to do something similar to the other city schools they oversee, and would be willing to enter into a five-year contract to operate Arlington should the state board approve this option. The big question here is whether or not such a move would be allowed under state law. Indianapolis Mayor Greg Ballard’s Office of Education Innovation currently monitors the city’s takeover schools. Reiterating the sentiments of many others in attendance, Director of Charter Schools Brandon Brown says in addition to figuring out a plan for Arlington, the collective group of education policy folks needs to focus on oversight. 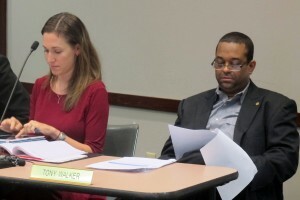 Representatives from turnaround operators and district officials in Gary made a similar point just a few weeks ago to this committee, asking that expectations be outlined for each stakeholder involved in the takeover process. Committee and state board member Tony Walker says in his opinion, the current law on takeover schools restricts the state board in terms of addressing issues on a systemic basis, and not just related to a particular school. He says one way to change that is asking the General Assembly to tweak the law to allow for more latitude. The committee did not make a decision Thursday. The final decision on Arlington’s future will be in the hands of the full State Board of Education. ← We’re Close To A New A-F Grading System, But How Is It Different?